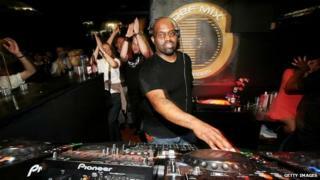 Musician Frankie Knuckles, known as the Godfather of House music, has died unexpectedly, it has been announced. A pioneer of house - the sparse, electronic dance music that emerged from Chicago in the 1980s - Knuckles was just 59. He was known for remixing tracks by Michael Jackson and Whitney Houston, as well as his own songs, such as Your Love and The Whistle Song. His death was confirmed by fellow DJ David Morales on Twitter. "I am devastated to write that my dear friend Frankie Knuckles has passed away today," he wrote. "Can't write anymore than this at the moment. I'm sorry." Knuckles' longtime business partner, Frederick Dunson, told The Chicago Tribune he had "died unexpectedly this afternoon at home". That was confirmed by the Cook County medical examiner who said Knuckles died on Monday in Chicago. The medical examiner said a cause of death was not available. Several music websites have reported Knuckles had died of complications from Type 2 diabetes. In the mid 2000's, the DJ had developed the bone infection osteomyelitis after breaking bones in his foot while snowboarding. In 2008, he had the foot amputated after refusing to let up on his punishing work schedule. Born in the Bronx, Frankie Warren Knuckles Jr learned his craft in New York City, where he was mentored by club DJ Larry Levan. "We would spend entire afternoons working up ideas on how to present a record so that people would hear it in a new way and fall in love with it," Knuckles later recalled. "To us it was an art form." He moved to Chicago in the 1970s, just as disco was dying out, and pioneered a style of extending soul and R&B records by adding drum machine loops. "I would program different break beats and use them as segues between songs and additional beats," he said in 2011. "I had my own little piece of heaven right there." He made his name at The Warehouse, a club in northern Chicago, predominantly patronised by gay men from the black and Latin-American communities. "The people that used to hang out at The Warehouse coined the phrase 'House Music'," Knuckles said. "At the time I was the only DJ in the city playing a sound that they heard nowhere else. "So, when dance parties and regional DJs began popping up on the South Side of the city, to attract the same kind of audience that I had at The Warehouse.... they would advertise that they played 'House Music'." By 1982, Knuckles had opened the his own venue for house music, called the Power Plant, where he premiered several tracks by local artist Jamie Principle, recorded on reel-to-reel tape. The DJ helped secure a commercial release for several of those tracks - including Your Love and Baby Wants to Ride - which are recognised as the some of the earliest house classics. Your Love is possibly better known in the UK as the backing track for The Source's hit remix of Candi Staton's You Got The Love. Knuckles also produced the house anthem Tears with Robert Owens, and began his remixing career with a version of First Choice's Let No Man Put Asunder. He later signed to Virgin Records, where he remixed or produced such artists as Mary J Blige, Janet Jackson, Pet Shop Boys, Diana Ross, Luther Vandross and Toni Braxton, and won a Grammy for best remixer of the year in 1997. Inducted to the Dance Music Hall of Fame in 2005, Knuckles also had a Chicago street named after him in 2004, on the former site of the Warehouse club. BBC Radio 1's Pete Tong was among those paying tribute to the star on Twitter, writing: "RIP gentleman genius, groundbreaker, inspiration. Blessed to have worked with you." "I can't begin to count the ways he influenced me but I will never forget," added house DJ Roger Sanchez. "Frankie Knuckles was so under-appreciated," added Questlove, leader of hip-hop group The Roots. "He was the DJ that DJs aspired to be." The star had been as busy as ever in the run-up to his death, playing London's Ministry of Sound on Saturday night. His Facebook page listed several upcoming dates over the next few months.